Alison Can Read: Hex, A Witch and Angel Tale by Ramona Wray: Interview and Giveaway! 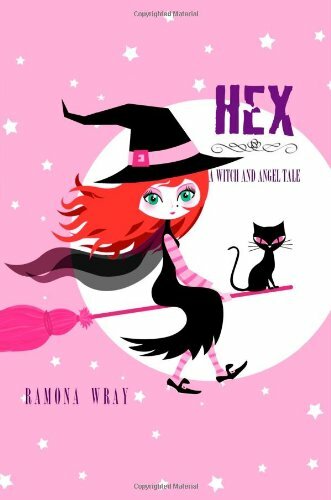 Hex, A Witch and Angel Tale by Ramona Wray: Interview and Giveaway! GIVEAWAY CLOSED! Thanks for entering! -I received this book free from the author in exchange for an honest review. Ramona was kind enough to answer a few questions for me. Please welcome Ramona to Alison Can Read! 1. Please describe Hex in a few sentences. Hex is a story about a lovable seventeen year-old, Lily, who can see into people's minds through a simple touch. This puts serious strain on her ability to form normal relationships with just about anyone, as people generally tend to steer clear of her. But then she discovers that her gift/curse doesn't apply when it comes to Ryder, the one guy she was always interested in. In comes a second guy, Lucian, and together they embark on an adventure that will lead to startling discoveries, impromptu trips to seventeenth-century England, and the unravelling of a very old curse that has been running all their lives for the past 300 years. It's a story of love, magic, and betrayal, wrapped up in the narrative of someone whose natural defense against the cruelty of others is to crack inappropriate jokes and laugh at herself. It's funny, quirky, and quite endearing, in parts. 2. Why did you decide to set the book in the United States since you live in England? Well, first of all, I was actually living in Russia when I wrote Hex :-) But I always knew I wanted the book to be published in the US, so it made sense to set it there. In fact, most of the books I ever wrote are set there, which is quite funny because I have never even visited the place yet. I guess I just find it inspiring. 3. I would love to visit Romania some day. What are a few must-see places? Lots. For a bit of history, you must see Transylvania, particularly Sighisoara, an authentic and extremely well preserved medieval town dating back to the 12th century. Gorgeous location. Then there's Dracula's Castle (or, as we call it "Bran Castle"), which is near Brasov, another historical place. The Danube Delta is a natural paradise for those interested in wildlife - over 2000 miles of marshes, reed islands, canals, little rivers - it really is an amazing spot. Bucharest, of course, still has some old neighborhoods that are worth seeing, architecture-wise. There are also a number of really old churches in Moldova (the eastern part of the country) which I think are spectacular (but then, I love old things :-) And, of course, the mountains. The scenery of the Romanian Carpathians is truly breathtaking. 4. What is your favorite place that you'd traveled to and/or lived? What place or places do you most want to travel to? Italy, no question about it. Where would I want to go? I guess, everywhere :-) The US is first on my to-see list. Other than that, I'd like to go to Rio, and Africa, and South America and, like I said, pretty much everywhere. 5. What is your writing process like? Are there differences when you write in Romanian versus English (i.e. the amount of pre-planning required) or is the language the only difference? 6. What are a few books that you loved when you were young and a few current books you've really enjoyed? As a child, I loved Adventures of Huckleberry Finn, Bridge to Terabithia, all the Greek myths, Jules Verne, H.G. Wells. On Christmas I always got a stack of records and then I'd listen to these audio stories, over and over again. Recently, I loved Before I Die by Jenny Downham, Demon's Covenant by Sarah Rees Brennan, everything by Maggie Stiefvater, or Holly Black. Right now, I?m reading The Iron Thorn by Caitlin Kittredge, and I'm quickly falling in love with it too. Enter to win a copy of Hex, A Witch and Angel Tale. Leave a comment with a valid e-mail address to enter. Enjoyed your review of this book and now I want it! Thanks so much for this giveaway! I got the opportunity to visit Italy back in college and I would go there in a second again if I could, I adored it:) Looking forward to reading this one! Thanks for the awesome interview and giveaway! Great review! I'm currently reading this and love it! I have been wanting this one for a while, the review and interview was fantastic!!!!! Nice review! This book looks really good and thanks for the giveaway! awesome give away! I have seen this book around the blogosphere for a few weeks now, after reading this interview i really want to read it! the cover reminds me of bewitched! Love the cover thanks for the giveaway! The book sounds really cute! I'd love to read it. This book looks so cute! Great interview too. I'm a GFC follower and I'm following Ramona on twitter (@bittenbooks). I really want to read this book - it sounds great! This book sounds intriguing. Thanks for the opportunity. I am a GFC follower. This looks like a fun book. New twitter & goodreads followe for Ramona. What a cute cover! And a cool story! I remember being fascinated with Greek mythology as a young reader, and even now, I still love reading fiction with mythological elements or references. Thanks for the chance to win! Great interview and thank you so much for the giveaway! this books sounds so great! Thanks for the review! Interview was also fun to read. Oh, this sounds like a really good story! :) Thank you for hosting the giveaway though I think if I don't win, I'll have to get a copy for myself! Thanks for hosting - sounds like a good one!